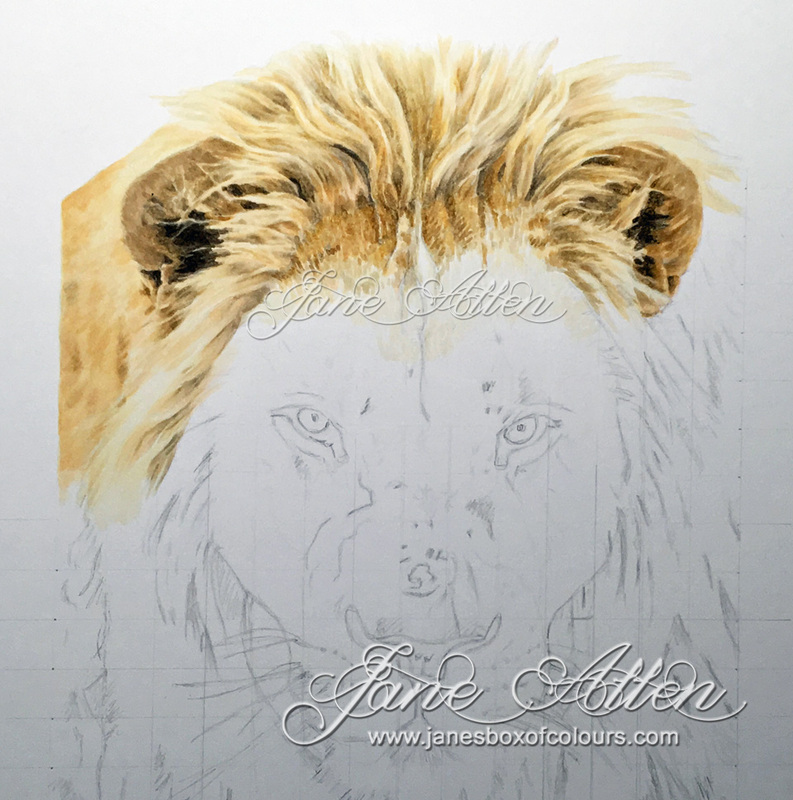 Jane's Box of Colours: Can you hear him roar? 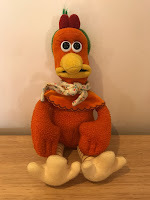 Have you been following my progress on Facebook? If not, don't worry here is a run down of what I have been up to over the last week! 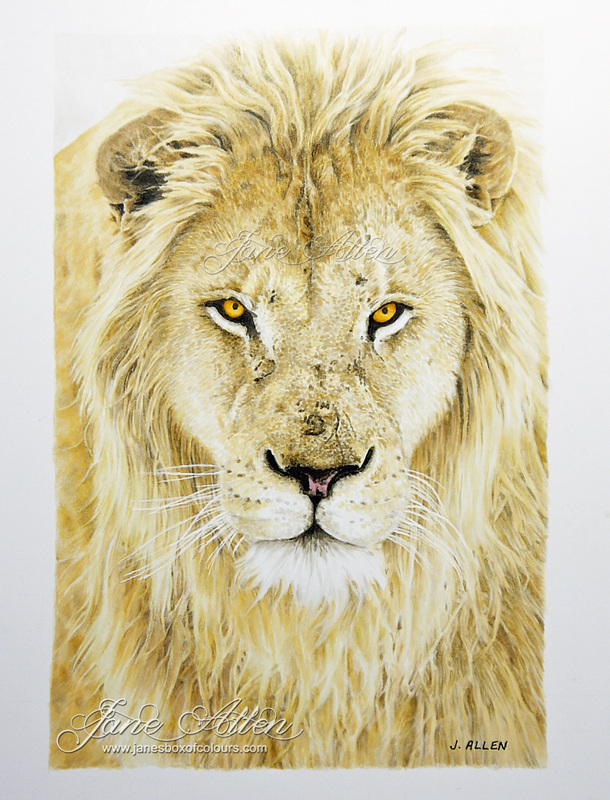 Do you remember my recent Artistic Expression post on the My Favorite Things blog that featured a lion? If you haven't read it, click HERE to see what I am referring to. This image was calling to me from the moment I saw it! It felt so good to be drawing again, something I intend to do far more in 2017! 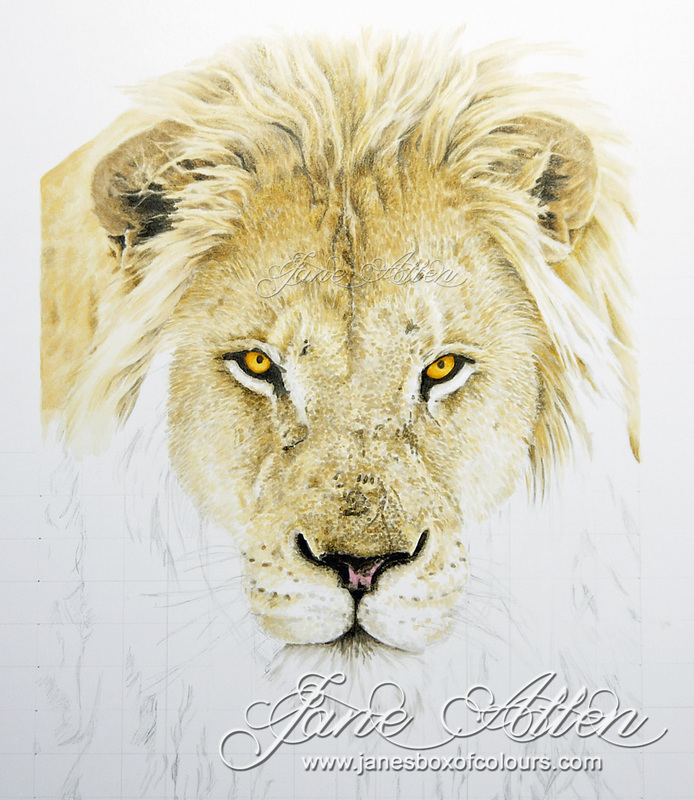 As you can see he's coming along, a combination of delicate lines, dots and flicking........lots of flicking. 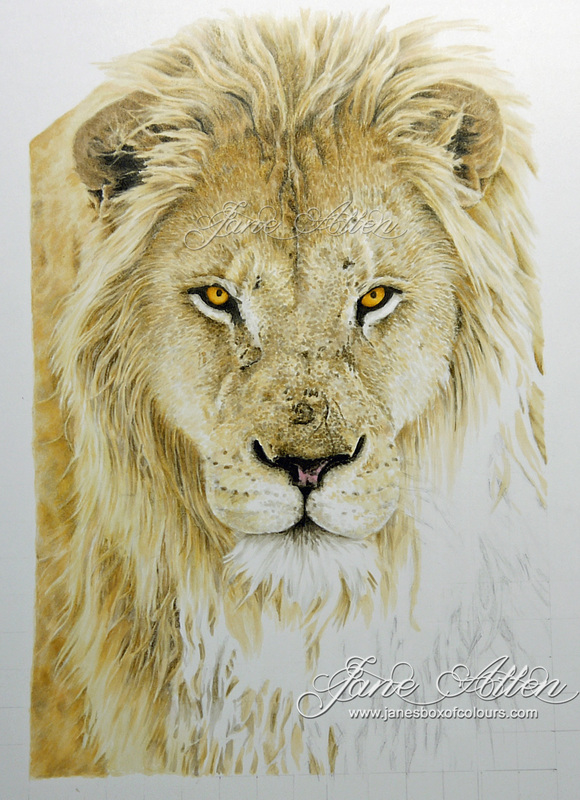 Ooh, those eyes......he came to life the moment I added colour to those stunning amber eyes! But, oh boy, Copic markers, especially the E family have a nasty habit of going sticky, most noticeably when you have the lid off of a marker for long periods of time as I did whilst colouring this boy. The alcohol in the ink evaporates, albeit very slowly and it alters the viscosity of the ink in the nib......basically it goes sticky. To compensate for this I try my best to keep the markers full of ink so they stay as juicy as possible and whip out the brush nib and replace it if it's really misbehaving. You can also use colourless blender to take the skin off an area that has gone shiny on your cardstock.......I lost count how many times I had to do that during this project. It enables you to add colour again, but you must do this with care. At this point, I did start to question why I hadn't chosen a lioness......way less hair! Oh well, I had started it and I just had to keep going. Here he is in all his furry glory! It was a challenge, especially fighting the Copics, but I was not going to let a few mischievous markers prevent me from finishing this project. I'd love to get my teeth in to another fine art project but I will have to wait until after my upcoming classes at My Favorite Things, Eustis, Florida. For anyone coming........it's going to be such fun..........Copic, Cadbury Chocolate and an English girl with braces on her teeth whose speech on occasion can be quite comical!!! 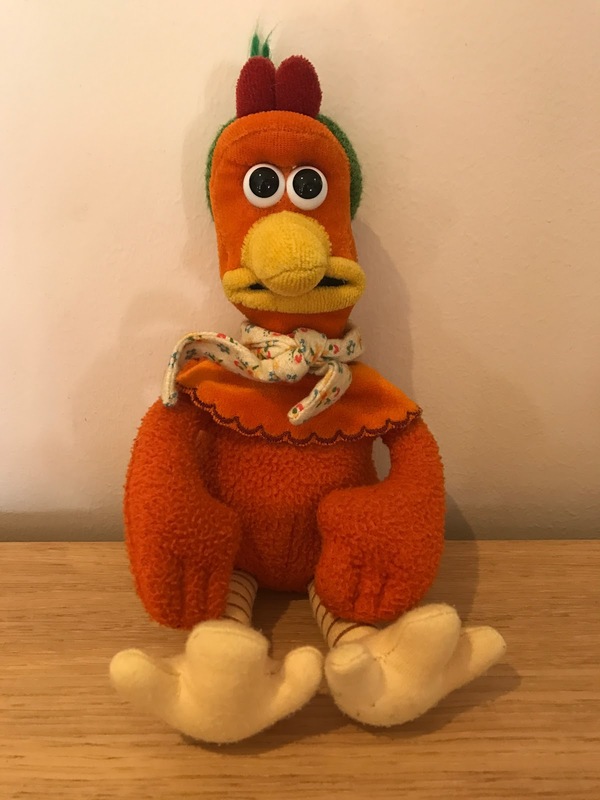 Oh and of course I cannot forget my chicken mascot Ginger who is coming with me! Pssst......my Saturday class has sold out but panic not, there are still a few spaces on Sunday 23rd April......so if this has inspired you to give Copics a go and you'd like to come spend 6 hours colouring with me, click HERE for details. Thanks for dropping by the blog today, I hope you have enjoyed seeing my progress and I'll be back again shortly with more colouring fun! Ditto what Joan B says above. Your work is utterly stunning. I'm speechless! WOW WOW WOW!!!!! This is STUNNING! Your talent blows me away! Seriously... I have been a fan of yours for awhile but normally don't comment much... I'm bad at that, sorry! But I had to comment on this... this is just GORGEOUS! So realistic and on point with every piece of fur to the bone structure of his head and jaw.... amazing! If you don't mind me asking, did you take any classes to learn to draw? Or did this come completely natural to you? I have always wanted to draw but I cannot draw anymore more than a stick figure. Stunning. Oh the hours of work - but what results. Ooh, as they say on your side of the pond, this is BRILLIANT! I am so looking forward to your class on the 22nd. I am sure I will learn a whole lot while having a lot of fun. I hope you will be flying over early to take in Disney World! My plane heads south next Friday, the 14th. You are amazing. It looks like a photo. Your talent is outstanding. Thanks so much for sharing your knowledge. You are such a great artist. 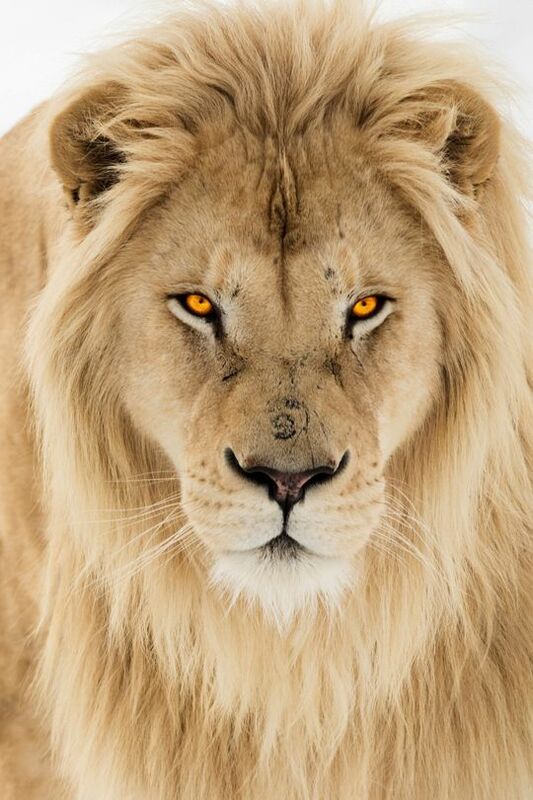 That lion is amazing!